Looking for a stairlift for narrow stairs? Or do you have trouble bending your knees? 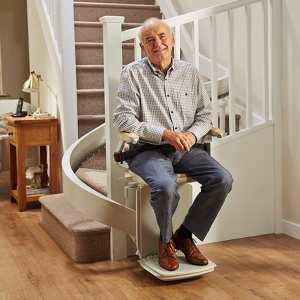 Our Perch model stairlift is specially designed to help people who have trouble bending or for especially narrow stairs. 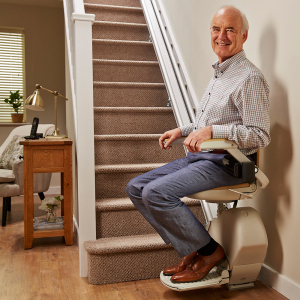 It has the same features as the 130 stairlift, and comes with a comfortable grab rail for extra security. Safety rail makes for safer and more comfortable ride. Secure safety seat belt system. Seat and backrest with soft padding. Digital display shows the status of the stairlift. Key lockable on/off switch allows the user to prevent others from using the lift. Safety obstruction sensors stop the stairlift if it comes into contact with anything. Two remote controls are included with large easy to use buttons used to call and park the stairlift.